FLUDD THE GUINEA pig has been spoiled by the folks at Dr. Richard Schwalbs veterinary office  but he just wants to go home! SULLIVAN COUNTY  July 14, 2006  They didnt come two by two, but the animals did come with the flood. The Sullivan County SPCA is filled to capacity with animals dropped off by owners who dont have homes left themselves. 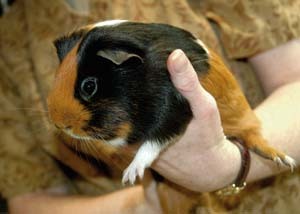 And a dog and a guinea pig are safe and sound in Jeffersonville  hoping their moms and dads will find them. Jean Smith was doing chores at her small Jeffersonville farm on July 5 when a boxer mix ran into her back yard. She shooed him away and went inside to make dinner. The tri-colored pooch had been standing in the middle of Likel Road, he said, howling a mournful sound. Kautz stopped, talked to the dog, and told him to go home. Instead, the dog followed him up to the Smith house and waited around while Tim worked on his car out front. Smith was sure Tims hound dogs who live in her backyard must be in heat and attracting the boxer. But a check of the hounds proved her wrong, and calls to the neighbors revealed the dog had been hanging around for days  and he didnt belong to anyone in the neighborhood. The family continued their evening activities, and Smith stood outside while Kautz worked on his car. Thats when he started with his hugs, Smith said of the dog. Cuddling the oversized puppy, Smith noticed his paw pads looked as though hed been walking for days. The top, where its kind of pebbly, was just lifting off, she said. Thats when she realized this dog had more of a story. She brought out food and water and examined him, looking over his chain link collar for clues. The exhausted dog ate ravenously, drank up the water and slept in the Smiths front yard where Jean left him in hopes that someone driving by would recognize their pet. He laid right down, settled in, and he was a happy pup, Smith said. As hes healed, hes progressively gotten more hyper and happier. But Smith knows he misses home. Hed go out in the middle of the road, and hed sniff like he was trying to find direction, she said. And he still hugs  even as hes regained his puppy playfulness, theres a sadness in his eyes. The Smiths have posted signs all over town, even putting a few up in Livingston Manor. Jean is sure he walked quite a distance, but she has no way of knowing where his home might be or if its even still there. Her main focus is finding this pups owner  with the collar on his neck and his knowledge of basic commands, she knows he was someones pet. Even if his family doesnt want him back or couldnt take him back because of the flood, shell find him a new home. But shed like to know. Calls can be made anonymously, she said, but she needs some direction. Just let us know  if they cant take care of the dog, Id hate to see it suffer, she said. The guinea pig found floating in the Callicoon Creek shortly after the flood isnt suffering. He has the run of a huge cage at Dr. Richard Schwalbs Jeffersonville Animal Hospital. But, he said, this poor little pig has been through a lot. Hes just scared, scared as can be, Schwalb said. The critter was discovered and rescued by a part-time county resident after the flood. But when the pigs heroine had to return to New York City, she turned to Schwalb for help. Schwalb has taken over the search for the pigs rightful owner, while his office lavishes Fludd with love. The guinea pigs owner can call the veterinary clinic at 482-5500, and the boxer mixs owner or potential adoptive parents should call Smith at 482-4163. The SPCA   always packed anyway, according to Recording Secretary Tammy Fis  is filled with animals dropped off after the flood as well as a number rescued in a cruelty case in Woodbourne. Some of the animals, including a pair of doves and a hamster, were returned to their owners as soon as they found homes, but there are still more than 50 cats and kittens and at least eight dogs just from the flood. To adopt these animals or to see if a pet lost during the flood is living at the SPCA, people should call 796-3120.